Day 2: A-Line Skirt Giveaway! Another day, and TWO more skirts! These are both samples from my Design and Sew an A-Line Skirt class on Craftsy. 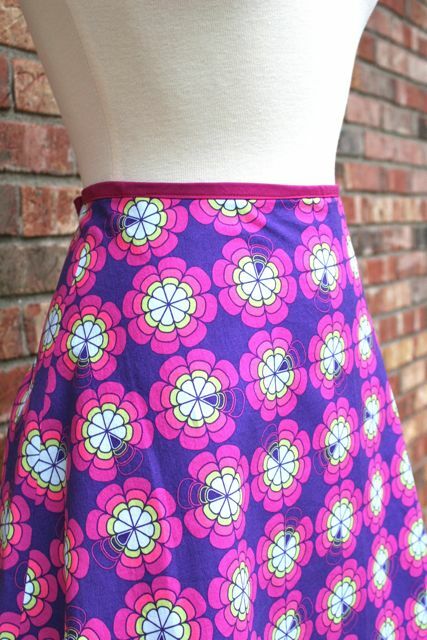 A couple folks have asked whether the pattern for these skirts is also available, and it is–when you make it! This online class covers the basic skills of patternmaking using an a-line skirt as the test subject. Through a dozen lessons and more than ten hours of video instruction, you’ll learn the foundational skills that will allow you to make this very pattern to fit YOUR measurements–and that includes how to properly take your measurements, so that all your patterns will fit better. As I mentioned in yesterday’s giveaway post, I made 16 samples for this class, so that I’d be armed with tons of variations to share on camera. I wanted to inspire and motivate every student who takes the class to feel empowered to make exactly what you dreamed of–and to maybe plant some ideas of the possibilities in your head. But I already have a whole closet FULL of skirts from Stitch by Stitch, and I hate the idea of being selfish and greedy and keeping every one of these a-line skirts to myself. I pulled out a few that I love, love, love and couldn’t bear to part with (I’ll share photos of those on Flickr later this week), and then selected others that, under the duress of an over-full closet and in the interest of generosity and Valentine’s Day spirit, I felt I could let go on to good and loving homes where they’d be worn and appreciated! 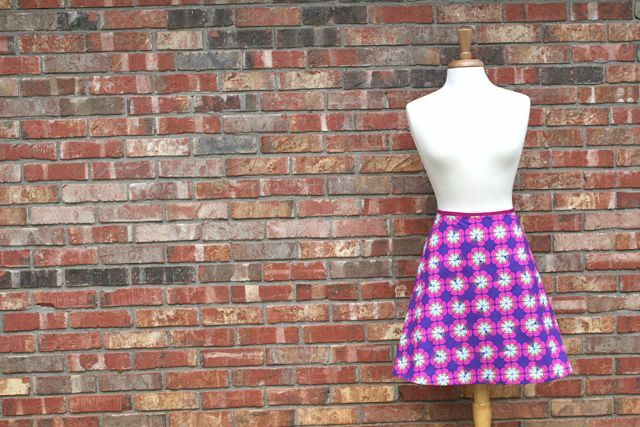 Today, two more skirts that represent additional techniques you learn in the Craftsy lessons, and ways the pattern can be adapted to your preferences as you draft it yourself! 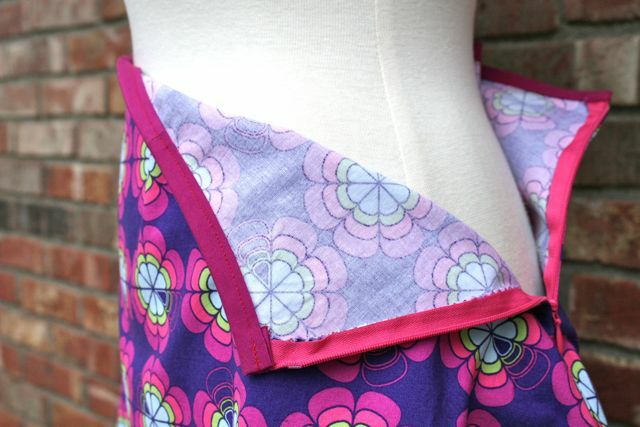 The first is made with slightly more volume than the ones from yesterday, using the slash-and-spread technique that’s taught as one of the lessons in Design and Sew an A-Line Skirt. So it’s got more flair than the others, which makes it swirly and fun! Add this amazing Patty Young print, and the fact that with the extra flair, this skirt lacks darts, and it’s a really great, modern look to wear in warmer weather. The odd lighting on this gloomy day doesn’t really do it justice, but the Kona cotton bias tape waistband is a dead match for the lovely plummy colors in this print. And I like that it’s a solid, so a contrast, but a subtle and classy one at the waistline. It will also define your waist with that horizontal line so, if you’re like me and pretty banana-shaped, you’ll have more curves in a skirt with this shape and a strong contrasting “belt” at the waist. I mean, how great is this print?!? I totally love it. And this plum color has been my obsession lately. I didn’t think I could really pull it off next to my face, even though I originally bought the print to make into a Tova, but a skirt! Sure! Of course, now that’s moot, since it’s going to belong to ONE OF YOU. Yay! Another invisible zipper, this one caught in the bias tape waistband. The waistband technique is clearly taught as part of the course, and there’s lots of up-close video action. 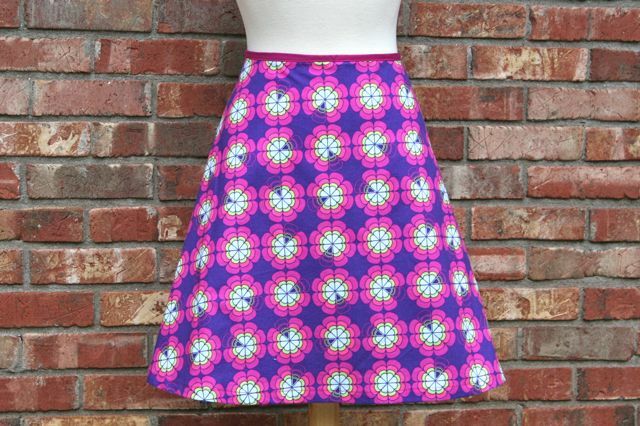 Second skirt today: this dreamy geometric print from Cloud9. I struggled the most deciding to give this one away, and not least because of the colors. I lurve the ruffle at the hemline, and think it’s such a simple but grown-up way to add a little sass to a simple skirt. I didn’t want to do anything too juvenile with this one, but a single, understated ruffle right at the hem seemed to strike the perfect balanced note of playful and sophisticated. This one has a facing at the waistline, and does have front and back darts. Upper waistline edge measures 34″, and the invisible zipper is stitched to the facing on the interior. All the raw edges of this skirt are finished with a simple overcast stitch using the sewing machine–no serger required! That technique is also taught as part of the Craftsy course. See what I mean about the ruffle? It’s dreamy. It is stitched above the finished hemline, so you won’t have to worry that it’ll fly up or reduce the overall length of the skirt–all of these are made to hit just above or just at the knee, so they’re pretty and feminine but also appropriately modest and classy. Audrey would approve. As before, simply leave a comment to win! You are free to comment on EACH of the four posts this week to enter to win one of the eight skirts I’m giving away–in fact, I’d recommend it, as it will quadruple your chances of getting one of these babies in the mail! International entries are welcome. Winners will be announced Monday, Feb 18 here on the blog! 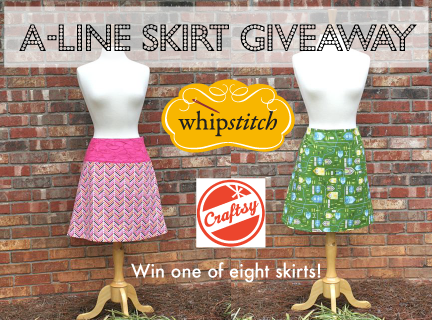 ← A-Line Skirt Giveaway from my Craftsy Class! Loving the detailed descriptions of the skirts! Lovely skirts. I appreciate the descriptions of each. They are giving me great ideas for spring skirts. Thanks! I’d love to be in to win the ruffled one! Oh please pick me! I love the simpatico ruffled skirt so much and having a cute skirt will give me some motivation to get back into shape quickly after this baby is born in June! Love it, would love to win! Super cute skirts! Thanks for the giveaway! Beautiful! I love both prints. The way you did that ruffle is really genius! Thanks for such a fun giveaway! WoW! Two more lovely skirts! I can see how gorgeous they are and I love reading your description of the skirts, beautiful words and beautiful skirts! 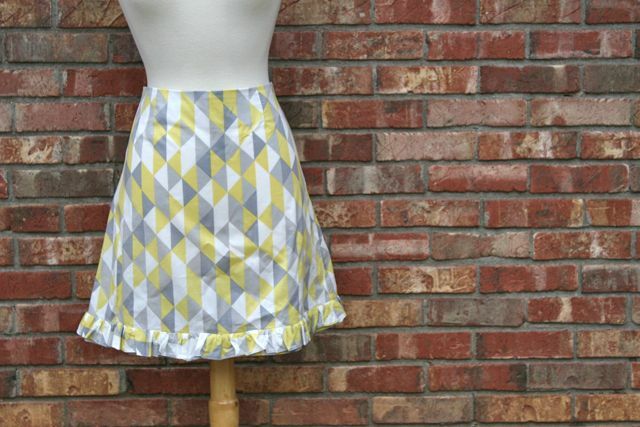 Love love love the yellow and gray skirt with the ruffle! 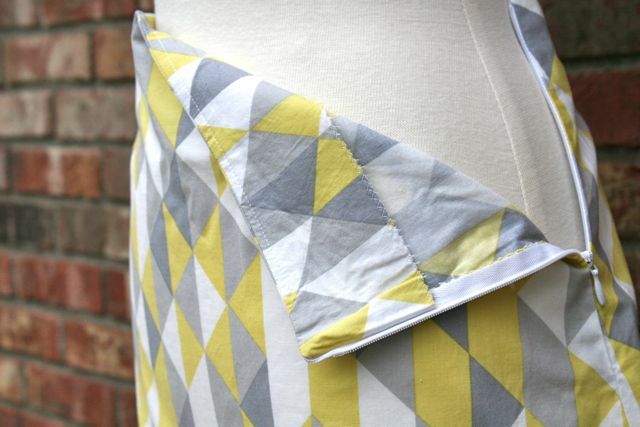 I love the yellow and grey print! I love the Cloud 9 skirt! These skirts are super cute, the fabrics give them a nice vintagey look. It’s almost spring time where I live, time for showing off my pale skin and happy skirts! Great skirts! I am in need of doing some sewing for myself…. Very nice skirts! Thanks for the chance to win one! They are both adorable, though I really, really love the ruffled one! Oooooohhhh! I love them both!! I love the ruffle! So cute. Fabulous!!! I’m trying to hone my skills with my sewing machine, but am yet to tackle anything wearable!! I’m definitely inspired when I see these lovely numbers! Hope I am proficient enough soon. Love love love! Especially the ruffle! Love that flirty little ruffle! i’m not usually a ruffly skirt kind of gal, but this one really is very simple and not too crazy – I love it!!! My SIL would love the grellow! I am thinking I should be signing up for the class…..
Just lovely! I hope I win! So cute, thank you for giving these away! I especially love the geometric print one. ok, i *really* need that yellow and gray skirt. The ruffle is so fun! Love them both! Especially the ruffle! I love the one with the ruffle, so cute! Thanks for the chance! I love the gray/yellow ruffle skirt.It’s definitely my favorite! Darling skirts! My daughter needs one for work! I don’t often wear skirts but I definitely would if they were this cute! Yellow and grey with ruffles? I may be in love. Thanks for the chance. I too love the ruffle one. Lookout summer! That Patty Young print looks a lot like a skirt my MIL gave me that she owned in her 20’s!